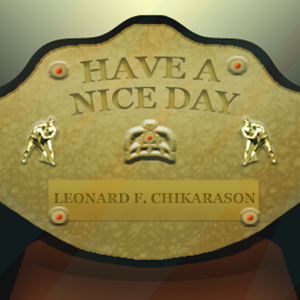 What better way to celebrate ten episodes of Have A Nice Day, than with an extra-special, deluxe episode with my first guest who is actually in the wrestling industry, commentator extraordinaire, Leonard F. Chikarason?! In this two-hour(!) chat, we go all over the place, from his teenaged run-ins with the ECW crew, to his current role as commentator for the remaining Wrestlings Is and Absolute Intense Wrestling. He also settles the very first Have A Nice Day feud, as Leonard addresses Chris Sims’ claims that indie commentators are too cool to call an Ace Crusher a Diamond Cutter. There’s also a lot of talk about comic books, even more than I anticipated. Enjoy the show! Check out Leonard’s own podcasts, The Weekly Longbox, and Dadstractions. If you’re anywhere near a Wrestling Is, or AIW show, you should pop in and say hello. Tell ’em I sent ya.